Britain’s Real Role in the World. 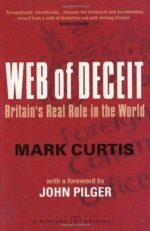 In his explosive new book, Mark Curtis reveals a new picture of Britain’s role in the world since 1945 and in the “war against terrorism” by offering a comprehensive critique of the Blair government’s foreign policy. Curtis argues that Britain is an “outlaw state”, often a violator of international law and ally of many repressive regimes. He reasons not only that Britain’s foreign policies are generally unethical but that they are also making the world more dangerous and unequal. Web of Deceit describes the staggering gulf that exists between New Labour’s public claims to uphold ethical values and the reality of current policies. It outlines the new phase in British global intervention, the immorality of its policy in Iraq, Afghanistan, Kosovo and Indonesia and support for repressive governments in Israel, Russia, Turkey and Saudi Arabia. Curtis also reveals Britain’s acquiescence in the Rwanda genocide and economic policies in the World Trade Organisation that are increasing poverty and inequality around the world. Drawing on formerly secret government files, the book also shows British complicity in the slaughter of a million people in Indonesia in 1965; the depopulation of the island of Diego Garcia; the overthrow of governments in Iran and British Guiana; repressive colonial policies in Kenya, Malaya and Oman; and much more. I am using your book “Secret affairs” as a source for my research about the Middle East. I found it thorough and praiseworthy. I didn’t understand “the Great Gookety Gook of the Muslim world. Page 67” would you mind putting this title in simple English words? I would be really appreciated.